Hard to believe but I actually added three coins this year. This set is one of my favorites. I do not see how I will ever improve it using all CAC coins. I did own the Pop 1 1881 68CAM. I was a beautiful coin but would not pass CAC. 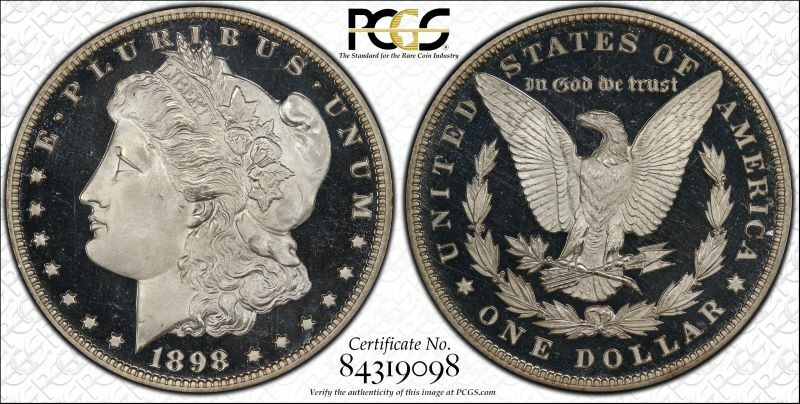 BTW: I believe CAC DCAMS with good reflection are the holy grail of Proof Morgan's. dark and you should have not to tilt the coin to see the toning. That is ok but they are second tier. add them. I am surprised I was able to acquire three amazing CAC coins that helped the set. 66 and higher. I think I own half of them and would buy others. I found some incredible high end coins this year which over came Bob's five 69's and moved my set back to number one. The 1895 in this set is probably the nicest example of this year that exists. It is highly toned and truly amazing. I replaced my 66+DCAM which is also amazing but not like this! This set is a major disappointment. A heart breaker. Morgan's are my favorite. This set was number one of all time for two years. It beat Mr. Simpson's set which has FIVE PR69's. I was able to rank higher by having the best and highest graded DCAMS. 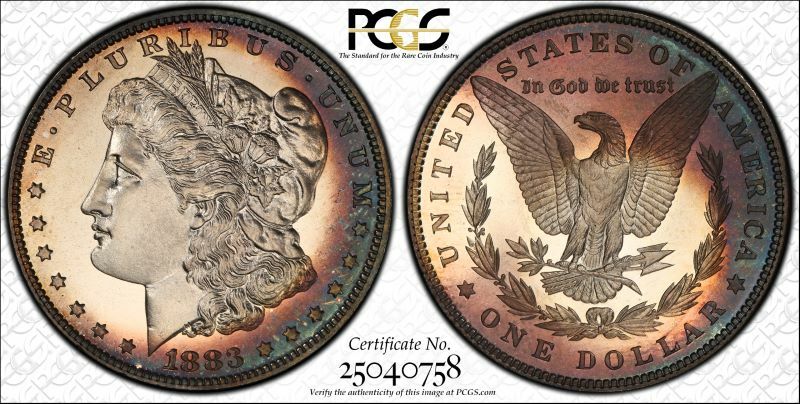 In case you are not familiar with PCGS scoring, a DCAM gets two additional points. In MANY cases a lower graded DCAM is rarer than a regular coin in the next grade. So a PR67DCAM can be much rarer than some PR68's. A PR67DCAM used to have the same score as a PR69. 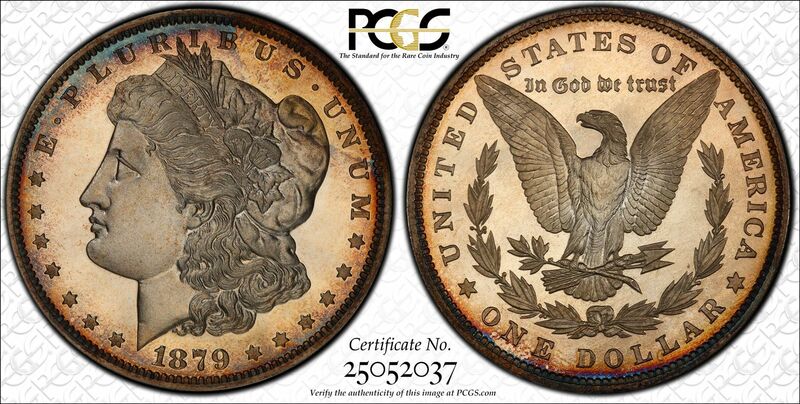 Early this year PCGS decided to give additional points to top pop coins and coins that are tied for the top pop. Mr. Simpson's score went from 68.42 to 69.18 without any of the coins being replaced/upgraded. It is now the top set even though the average grades of the coins are lower than mine. This is hard to comprehend and unfair. I have the utmost respect for Mr. Simpson and love the coins he buys and his sets. Bob, if you are reading this perhaps you would consider having PCGS remove the top pop extra points and competing with me on an even basis? If not, congratulations. I submit! WOW! THIS COIN IS SIMPLY AMAZING. 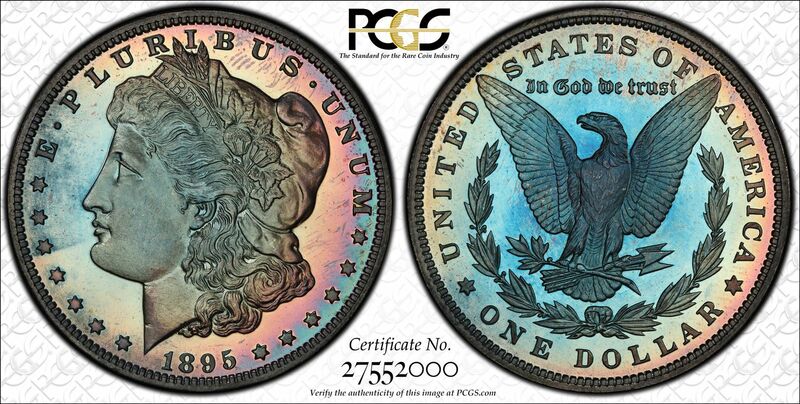 100% ORIGINAL, TONED WITH GREAT MIRRORS A 10 AND THE BEST 1880! 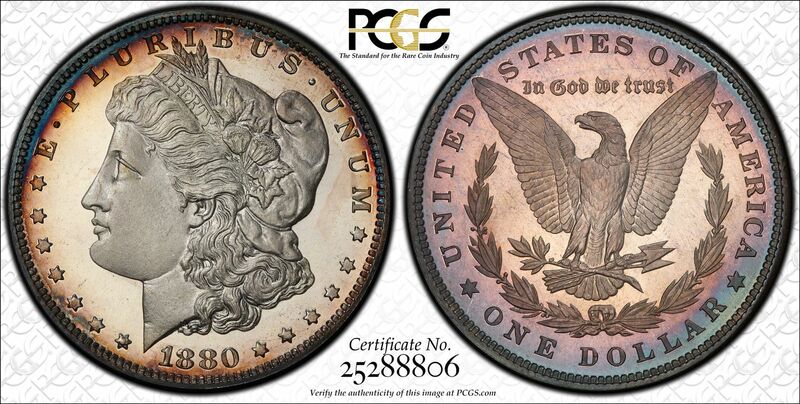 CAC POP 1 PCGS AND CAC OGH PROBABLY A 69! CAC THIS COIN LOOKS LIKE IT JUST CAM E FROM THE MINT. HARD TO BELIEVE THERE IS A 69! CAC i DO NOT KNOW WHERE TO BEGIN. i HAVE SEEN HUNDREDS OF 1895 DOLLARS AND THERE IS NO QUESTION THAT THIS IS THE NICEST ONE IN EXISTANCE. i DO NO THINK THERE COULD BE A BETTER ONE ANYWHERE. 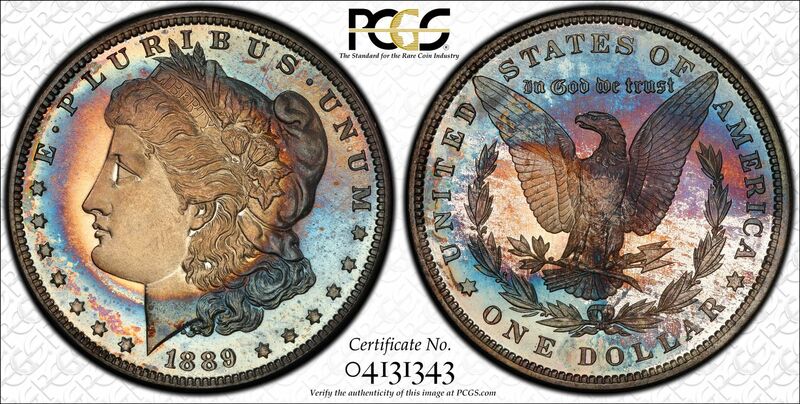 YOU RARELY SEE A TONED 1895 LET ALONE ONE WITH AMAZING CAMEO TONING. This coin is one of my favorite Morgan's and must be seen to realize how incredible it is. I have a 66DCAM which is also amazing that this replaced. 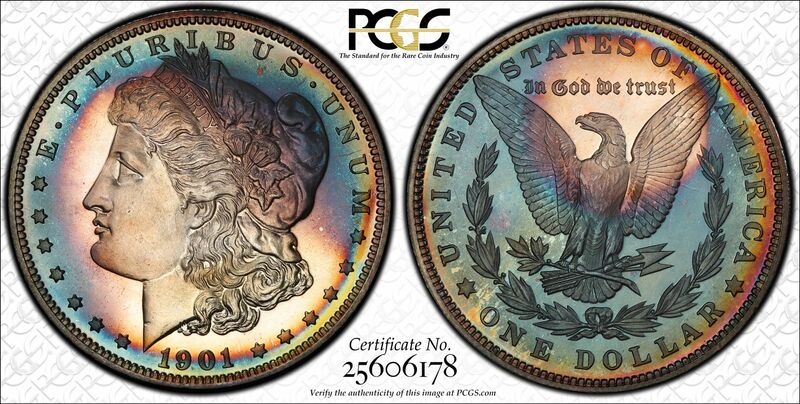 CAC PCGS SAYS POP 4 BUT i HAVE NEVER SEEN ANOTHER CAC 2 YES JFS ANOTHER 11 DEEP BEAUTIFUL COLORS TO SEND THE SET! Thanks for the heads up about the DLRC coin. I was aware of it. This is a jaw dropping amazing set. Congrats to Perfection 13!